The post Karan Johar Says He’s Facing Technical Trouble, Denies ‘Liking’ Tweet Abusing SRK appeared first on Bollywood latest news. #ShahRukhKhan reacts on Karan Johar's tweet abusing Shahrukh's film, #KanganaRanaut announces new film, to play Jaya in Jayalalithaa biopic, Bombay times Fashion Week 2019 are among the Top 10 News In #BollywoodNow Daily Wrap. 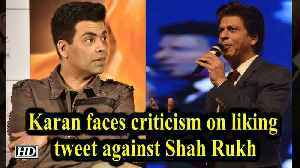 Shame On #KaranJohar trends online after KJo likes tweet on #Kesari abusing #ShahRukhKhan. Watch Shahrukh Khan's reaction to the same.